Teac Campbell is a family run Bed and Breakfast situated in the heart of Gweedore. The accommodation at Teac Campbell is of a high standard. All bedrooms in our Bed and Breakfast are en-suite with TVs. Free Wi-Fi is also available to our guests. Many of these rooms, along with our spacious TV lounge enjoy spectacular views of the Atlantic and offshore islands. Throughout the house modern comforts blend well with the old world charm. Pictures and paintings of bygone days and items of nostalgia adorn the walls. In the dining room the pine dressers and furniture create an intimate rustic setting where you can enjoy the freshly prepared wholesome food. 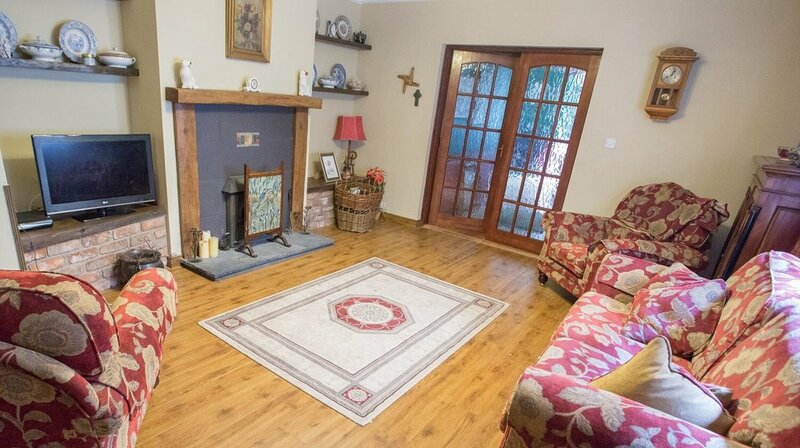 The features along with the open turf fire give a lovely cosy feel which adds greatly to the character of the house. We pride ourselves on our personal attention and friendly service. Here we extend a warm welcome or cead míle fáilte to our first time guests or our many friends who return regularly. All rooms are en-suite with TVs. Many of our rooms enjoy spectacular views of the offshore islands. We have a large lounge for meetings. Complimentary full Irish breakfast or continental option available. Free WiFi available to guests. We can give expert advice on all local activities.